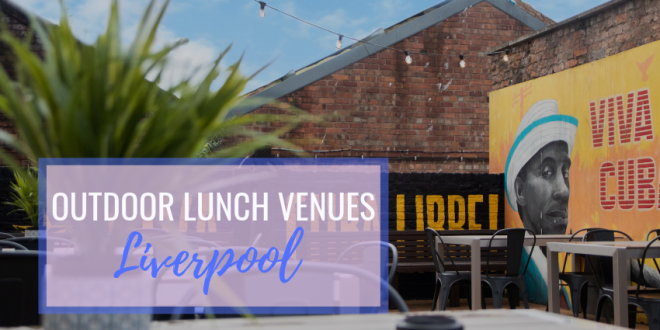 Summer is on its way and with the days getting longer and the nights getting lighter, it’s the perfect time to dine in any of these outdoor lunch venues in Liverpool. Now that the warm weather is just around the corner, we can look forward to topping up our tans and dinning alfresco. If you don’t know who Gino D’ACampo is then where have you been? The Italian TV personality has his very own restaurant with one of the loveliest, outdoor lunch venues in Liverpool in the heart of the business quarter. Pop in for a glass of prosecco or take a seat outside and watch the world go by as you dine on dishes designed by D’ACampo himself. From Fettuccine to Tiramisu, Gino’s is one of the best outdoor lunch venues in Liverpool. Perhaps the most charming outdoor lunch venue in Liverpool, HUS is certainly a restaurant with a difference. During the day, HUS serves breakfast and lunch to the masses. Then, at night, HUS transforms into a late-night cocktail bar that hosts live performances from local and international artists. This is a Liverpool dining space like no other. Olive is an Italian restaurant that specialises in hearty rustic dining. Their lunch menu is ideal for those who enjoy an Italian meal, be it a creamy risotto or a tasty pizza, in the sunshine. Furthermore, the lunch menu includes a glass of wine or a soft drink to accompany your delicious meal. The perfect deal for outdoor dining in Liverpool. For a Brazilian dining experience to remember, Fazenda is a must visit for the meat lovers among you. In order to appreciate the full Brazilian dining experience, make sure to bask in the blazing sunshine in the chic outside seating area. Bringing a taste of fine dining to Liverpool, the talented chefs from Carpathia Champagne Bar and Restaurant have devised a delightful maritime menu to enjoy on their stunning rooftop terrace. The lunch menu is constantly revamped to reflect the seasons so right now, diners can enjoy cured mackerel dishes, chicken or salmon and a mouthwatering selection of desserts. So, if you’re feeling peckish at lunchtime, pop into 30 James Street and visit Carpathia’s rooftop terrace – one of the best outdoor lunch venues in Liverpool. This outside space is a sun trap with a well-stocked bar and a fun and vibrant atmosphere. There is always something going on at Constellations, from family-friendly events to vinyl records sales and outdoor markets. Their weekday is made up of all the usual yummy things you’d find at a BBQ and, during the weekend, they break out the brunch menu. The luck of the Irish landed McCooley’s smack bang in the middle of one of the busiest areas in Liverpool. The outdoor area consists of barstools and high up tables sat on the edge of Concert Square. You and a few friends can soak up the dynamic atmosphere of Liverpool whilst tucking into a massive selection of classic pub meals with a playful Irish twist. For the perfect slice of pizza in a secluded outdoor space, head to The Merchant for lunch in Liverpool. Every now and then the odd pie or burger may appear on the menu, but, you can always count on a huge slice of pizza and copious amounts of gin. During the day, the garden is a chilled-out place to enjoy a natter with your mates while at night, the venue comes alive with a variety of music from a well-crafted playlist. With a wicked lunch menu and friendly welcoming vibes, The Peacock is one of the coolest outdoor lunch venues in Liverpool. Load up some fries with anything that tickles your taste buds and soak up some of that mid-day sunshine whilst it lasts. Oh, and did we mention they do delicious fruity cocktails too? Alma De Cuba is one of the hottest venues on Seel Street. The Caribbean-Latin American themed restaurant and bar is the ultimate exotic escape this summer. Alma De Cuba evokes images of paradise – perfect for those summer sessions and liquid lunches. Furthermore, Alma De Cuba serves up a Cuban inspired menu that is perfect for when the temperatures start to rise. Kazimier Garden is one of the best outdoor lunch venues in Liverpool. Serving delicious cocktails and preparing food fresh from the grill, diners here can enjoy the sunshine whilst sat in this quirky inner city garden. The lunches here are delicious and, during the summer, diners can even look forward to a spot of live music every now and then. Not many people know that American Pizza on Bold Street has its own outdoor seating space. Small but cute, American Pizza slices’ outdoor space is a little secret that everyone should be in on. The team at Mulholland Singing Diner are renowned for their incredible, fresh menu which features some of the most amazing food in the city. Perfect for capturing the last of the day’s rays before sunset, Arthouse Hotel’s new outdoor terrace will be among the best places to eat and drink in Liverpool come summer time 2019. Setting up shop outside the superb movie-themed hotel, the latest addition to Arthouse Hotel’s social venues will take advantage of a truly unique location. So, whether it be Mulholland or Arthouse’s new outdoor terrace, head down to this unique venue this summer. The Buyers Club is a venue that likes to make the most of any sunshine in Liverpool. You can guarantee a festival or live performance will be taking place during the summer months, while their menu will be adapted to suit the mood. The hidden garden terrace is always packed, while the friendly atmosphere allows you to come together and meet new and interesting people each and every time you visit. Free State Kitchen’s back garden has one of the largest outdoor lunch venues in Liverpool. A beautiful space that is homely and inviting, FSK’s menu is made up of locally sourced produce. At Free State Kitchen, the mood is relaxed and the food is out of this world. World class burgers with quirky toppings and a long list of appetisers can be enjoyed alfresco style in FSK’s sprawling backyard. A little out of the city centre in Liverpool’s historic Georgian Quarter, The Quarter is one of the more relaxed and easy going outdoor lunch venues in Liverpool, that provides amazing food and a service to match. When the sun is shining, this outdoor lunch venue in Liverpool is the ideal place to admire the historic surroundings of the Georgian Quarter. Sit street side under the gleaming sun, surrounded by bespoke boxes filled with all types of summertime flowers at Salt House Tapas. Here, diners can enjoy picking from tiny plates of gastronomic perfection. The menus at Salt House are made up of classic Spanish dishes as well as some of the chefs own delicious creations. Salt House is the ideal place to catch up with friends in the city centre. It’s that time of year again when the smells of charcoal and roasted meat fill the air. In the summer, The Clubhouse’s outdoor eating space is filled with visitors looking for a bite to eat in the sunshine. Resembling the chicest social clubhouses from New York suburbia, The Clubhouse’s white wooden clad terraces make for one of the most inviting outdoor lunch venues in Liverpool. For lunch with some extra added spice, Wahaca is a must visit. Not only does Wahaca have a menu filled with delicious Mexican-themed delicacies, but visitors can enjoy their tasty dishes in a quaint but chic garden terrace. Soak up the sun and the Mexican vibes at Wahaca when you next lunch in Liverpool. If you enjoy getting your daily dose of Jamie Oliver from one of his many TV shows or cookery books, it’s time you tried the real thing at Jamie’s Italian on your next visit to Liverpool. Located in the city centre, Jamie’s Italian is one of the best outdoor lunch venues in Liverpool. Yet another delightful outdoor lunch venue in Liverpool is Panam. After a stroll around The Albert Dock pop into Panam, take a seat dockside and enjoy your lunch. At What’s Cooking, diners can sit waterside and enjoy a delicious meal and some quirky drinks. You can’t get much closer to dining on the Mersey than at Matou. The rooftop terrace boasts some of the most spectacular views of the city. Coupling amazing outdoor seating with a spicy Malaysian menu and a list of tasty cocktails makes Matou one of the best outdoor lunch venues in Liverpool. Another of our fabulous outdoor lunch venues in Liverpool that has superb waterfront views is Oh Me Oh My. 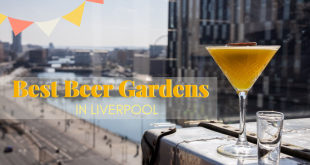 This amazing dining space has a sprawling outdoor terrace that directly overlooks the Royal Liver building so, whilst enjoying the splendour of Liverpool’s stunning architecture, you can relax in the sun whilst eating from their amazing lunch menu. Ma Boyles is one of Liverpool’s most well-established eateries. Ma Boyles offers diners a menu of good traditional pub grub and is the perfect place to visit in the summer. The outdoor space for dining is also charming. So, there you have it, 25 fabulous outdoor lunch venues in Liverpool you need to try! We hope you enjoyed our guide and, if you think we’ve missed any, put them in the comments below. Plus, if you’ve got room for dessert, why not check out our guide to the best desserts in Liverpool and have a truly indulgent time.